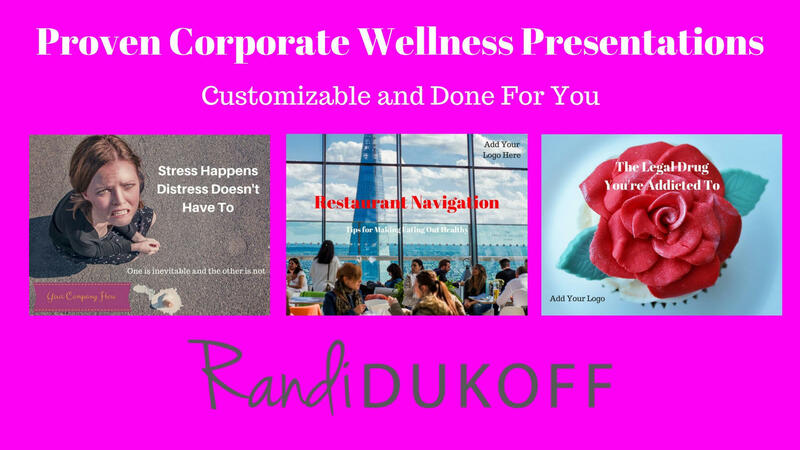 The author of these Done-For-You (DFY) Presentation about sugar, eating out and stress , Randi Dukoff, has been presenting to large corporations on the topic of employee health and wellness since 2011. Now you can use the very presentations she has utilized with corporations like Time Warner Cable and many others in your own Corporate Wellness practice! SUGAR: This presentation on Sugar offers in-depth statistics and research into the effect sugar consumption has on the emotional and physical health and wellness of employees, and offers alternatives and suggestions for healthier options. DINING OUT: This Presentation addresses the pitfalls that can occur when corporate employees and sales staff are frequently traveling and the need to dine out for every meal becomes a necessity. It discusses where the problem areas are, and gives suggestions and options for appetizers, meals and even beverages to help employees maintain their healthy eating habits while traveling and entertaining clients. STRESS: This Presentation addresses the various potential Stress Factors employees may encounter. Gives suggestions on how to strengthen your body, address your mindset and plan your day to minimize negative stressors and perform at higher levels. Lastly, techniques are given to eliminate the physical stress from the body.